I have to praise Nazarian's artistry when it comes to the written word. She seems to enjoy the language and it felt like she was painting with her words. But after about thirty pages, it started to very much feel like the canvas was growing much larger than necessary and the painting started to get very, very repetitious. As the story goes, Death appears to a dying monarch and demands his Cobweb Bride. 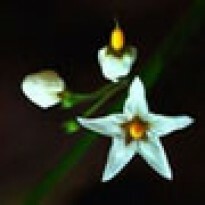 The monarch, who should have breathed her last when Death arrived, instead rattles on. Simultaneously, he visits a battlefield and the warring soldiers find themselves missing blood and body parts, but they are not officially dead. Then there is a celebration for the sixteenth birthday of the Infanta. Celebration turns to murder, but the dead won't die until Death finds his Cobweb Bride. And there is another dying woman, this the grandmother of our heroine, Percy, who is able to see the shadows of Death, who visits Percy's grandmother and makes his demands there as well. In case we missed all that, we get to revisit all of these places and go through the details of the undead and the conversations of those around them several more times before all come to the conclusion that Death won't let anyone die until he gets his bride. Buuuuut just in case it wasn't clear, let's also throw in one butchered pig that continues to squeal. After 100 or so pages ... I get it. Death. 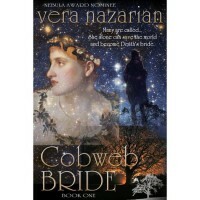 Cobweb Bride. Or else zombies forever. Someone finally figures out that the solution must be for eligible ladies to make their way to Death's Keep. One of these young women is Percy - Persephone, whose name, from Greco-Roman mythology, should already link her to Death. Percy is, apparently, a rather plain, perhaps even ugly protagonist. I point this out, because it is repeatedly pointed out within the story. I am all for heroines (and heroes) not being typical beauties, but I was disappointed in the need to have her appearance juxtaposed with her beautiful sisters who are the favourites of her beautiful mother and her formerly beautiful grandmother. I feel that if a writer wishes to portray a "plain" heroine, there shouldn't always be a need to point out how plain or even ugly she is, by ensuring that there are always paragons of beauty available for comparison. If the point is that heroes can be everyday people who aren't gorgeous examples of humanity, then why not allow everyone in the story to reflect reality in that way.